Sailing on the Peace Boat, an 11 floor, luxury cruise ship from Capetown to Namibia, ex-Kāpiti College student Emily-Rose Reid is on the trip of a lifetime but not as a guest. 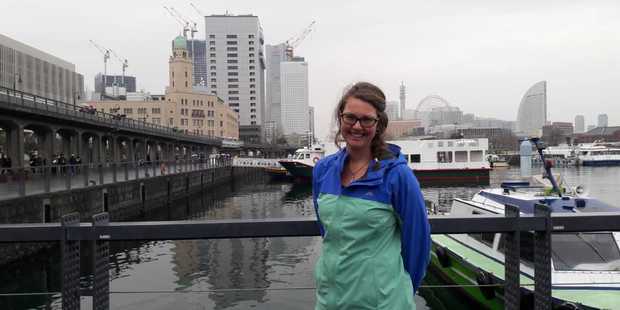 Having heard of the Peace Boat several years ago and going through a thorough application process last year, Emily-Rose is on board the vessel which is run as a not-for-profit organisation for three months in a volunteer capacity teaching English and Spanish. The Peace Boat runs educational seminars and exchanges with international guest speakers and partners in each port visited. 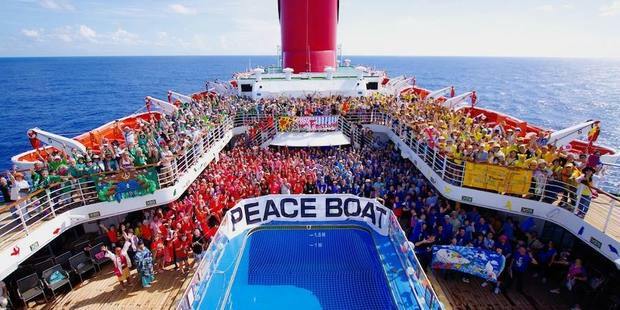 Sports day on the Peace Boat. One of nine volunteers on their 100th voyage, Emily-Rose is representing New Zealand as the only New Zealander on board the Japanese vessel. "As the only New Zealander on board and an ambassador for our country, I am representing you to the best of my abilities in international waters. "I am overwhelmed by the people I have met so far, the support of all of my whānau that has enabled me to be here and this motivates me to use these experiences as fuel for the fire of our future." Leaving New Zealand for Japan on December 16, Emily-Rose underwent training in Tokyo before boarding the luxury vessel and departing from Kobe, Japan, on December 27. "It is pretty fancy. After our training we boarded the boat and I was not expecting the size and luxurious nature. "I settled in with my roommate who I have come to think of as my adopted Japanese sister." The vessel has 1000 paying passengers ranging in age with the purpose of enjoying a 'satisfying and educational journey'. Along with teaching Spanish and English, Emily-Rose has spent her time visiting and meeting locals in villages where the vessel docks. She also attends lectures and meets people from across the world and different academic disciplines. "A particular favourite for me was listening to the talented photographer Iguchi Yasuhiro in Japanese translated to English talk about his experience of indigenous exchange between the Ainu (Japanese) and Māori people of Aotearoa. "It was both moving and an honour to see some of my home while on board this large international ship, captured in film and photos and being shared with so many people. "I also attended a lecture by Lars R. Lindkvist who has worked in environmental conservation in Scandinavia, Africa and India and is currently based in Kenya focusing on sustainable agriculture, responsible travel and ecotourism." With many interesting lectures and experiences, Emily has had the opportunity to meet professors, environmentalists, conservationists and a host of interesting people sharing meals, star-gazing and talking long into the night with the likes of Lars R. Lindkvist, Wanjira Mathai and Percy Yip-Tong.